Looking for the best way to get a smooth, baby-soft shave? 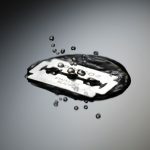 Straight razors are taking the world of men’s grooming by storm for their ability to cut close to the skin while providing the maximum comfort for the shaver. 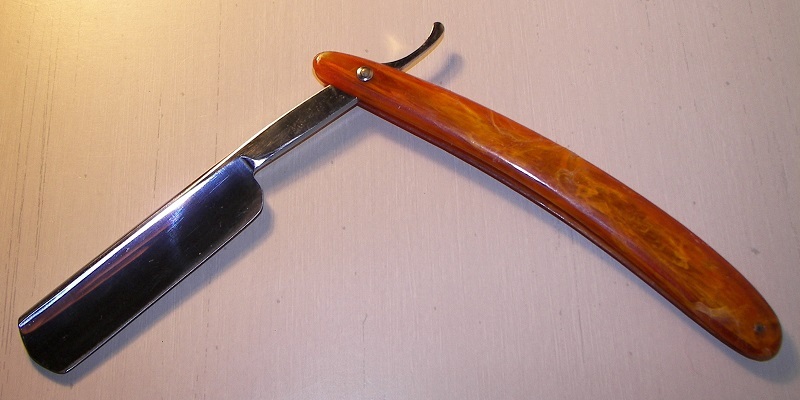 When it comes to how to shave with a straight razor, there is more than meets the eye. Shaving with a straight razor is a lost art. Because it is only recently that it’s come back into fashion, there are many tricks to manipulating the blade that can trip up the neophyte. Additionally, the blade itself requires pre- and post-shave maintenance. That’s why we’ve compiled this step-by-step method for how to shave with a straight razor. Straight razors have a reputation for being incredibly sharp. 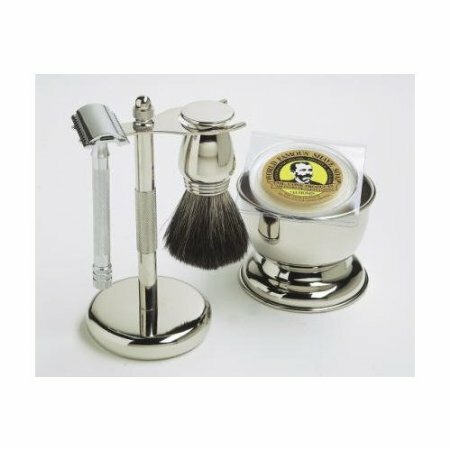 This is what allows the razor to slice cleanly through hair without catching, and is referred to as being “shave-ready.” In order to attain shave-ready status, your razor will first need to be honed by a professional, then stropped at home. Honing is a process that can take a while to master, so most people use the services of professional honers. 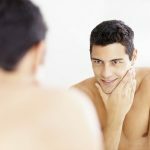 However, with a honing stone and time, you can learn to do this yourself, although you may want to first wait until after you’ve mastered how to shave with a straight razor. Honing should be done at least once a year. 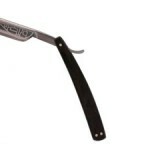 Stropping is a way to maintain the sharpness of a honed razor, extending the time between honings. A leather strop is a long piece of leather paired with a piece of canvas or linen, with fasteners on both ends. Stropping must be done before every shave. In order to strop, first, secure one end of the strop on a hook and hold the other end so that the strop is horizontal. Then, using the canvas or linen side, run your razor along the strop, leading with the spine of the blade. Don’t put pressure on the blade, just draw it along evenly, making sure the whole blade touches the surface of the strop. At the end of the draw, roll the blade over on its spine and draw the blade in the other direction. Do this 20-30 times on the canvas/linen side and then 50-60 times on the leather side. 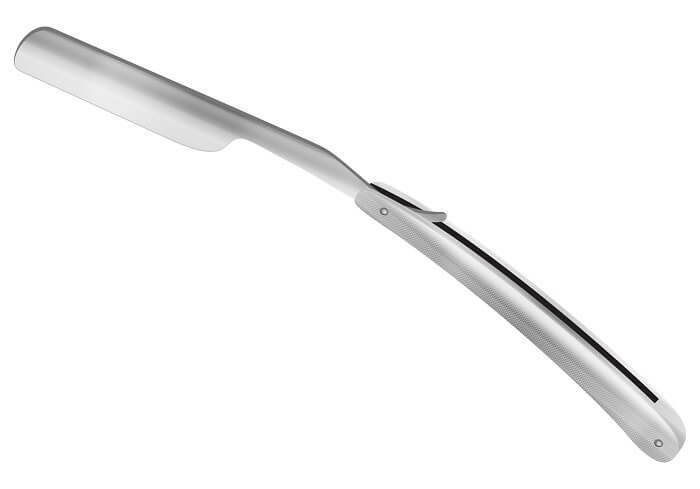 A nice, sharp razor is half of how to shave with a straight razor. The other half is making sure your face is ready to accept the blade. Your skin needs to be supple and well-moisturized to avoid the nicks, ingrown hairs and unsightly razor rash that are so common with mainstream multi-blade disposable razors. The usual approach is to shave right after a hot shower. That way, you can be sure of the pliancy of your skin. If you can’t shower before the shave, try covering your face with a hot, wet towel for 30 seconds to simulate the effect. Next, work up a good lather with your favorite soap, a boars hair brush, and a mug. Apply plenty of lather to the areas you wish to shave. 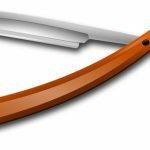 So, how to shave with a straight razor? Your facial hair grows in different directions depending on where it is. There might be patches that grow upwards or across on the outer part of your neck, while the hair right below your nose and covering your cheeks may grow downward. Thus there are three directions in which you can shave: with the grain, across the grain, and against the grain of the hair. Begin your shave by shaving with the grain of the hair. Using short strokes, gently pull the razor against your face. It should feel smooth; if you feel any pulling of the blade, then it’s not sharp enough and you should restrop it. If you’re new to shaving with a straight razor, then give yourself time to get used to handling the blade. You’ll need to use your dominant and non-dominant hands equally to get an accurate shave. For those with thinner hair, shaving with the grain is often all you’ll need for a professional look. But for a closer shave, you can shave across the grain next. Wait to attempt this until you’ve got a few with-the-grain shaves under your belt, as it can get awkward, particularly when it comes to the mustache area. Finally, for the especially fast-growing hair, you may need to shave against the grain after the first two passes over your face to ensure that it stays smooth well into the evening. You’ll need to be quite comfortable with your razor to attempt this. It can also increase your risk of developing ingrown hairs, so don’t shave against the grain every day. 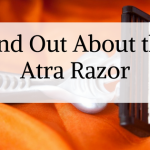 Once you’ve completed your shave, your skin might be feeling a little bit raw, especially if you’re not used to the feel of a straight razor. 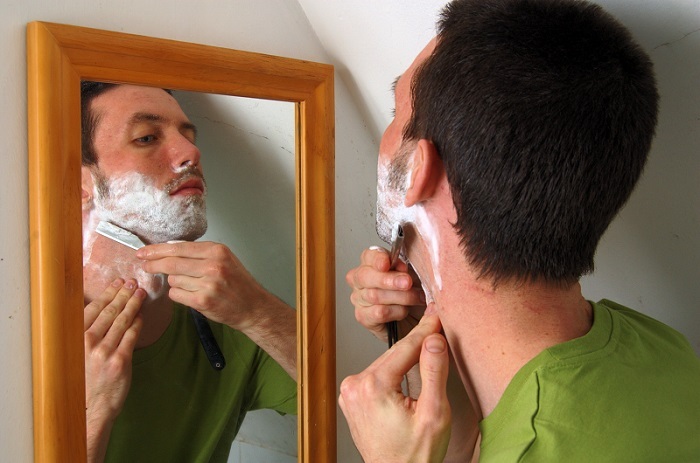 Avoid alcohol-based aftershaves, as they can sting and irritate the skin even further if you have a mild razor rash. Instead, invest in some alum and witch hazel. Alum is an antiseptic astringent sold in block form that that can help with small nicks and rashes, while witch hazel is a plant extract that tightens the skin nicely. Apply the alum to your face right after a shave, and then use the witch hazel to help wash it off. Afterward, gently rub your favorite moisturizer into your skin. Finally, dry your razor carefully, paying special attention to the hinge and the interior of the handle where the blade will rest. Blade oil will help to prevent rust. Using a straight razor is a rewarding way to keep your face smooth and fresh daily. With the steps presented above, you’ll be able to easily learn how to shave with a straight razor. 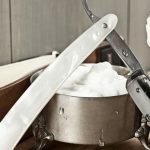 If this article inspired you to pick up a straight razor, share with us your own tips, tricks, and experiences. Manly Gifts For Men – What Could Be Better? 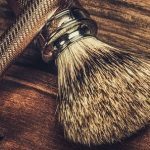 Single-Blade Razors: To Use, or Not To Use?